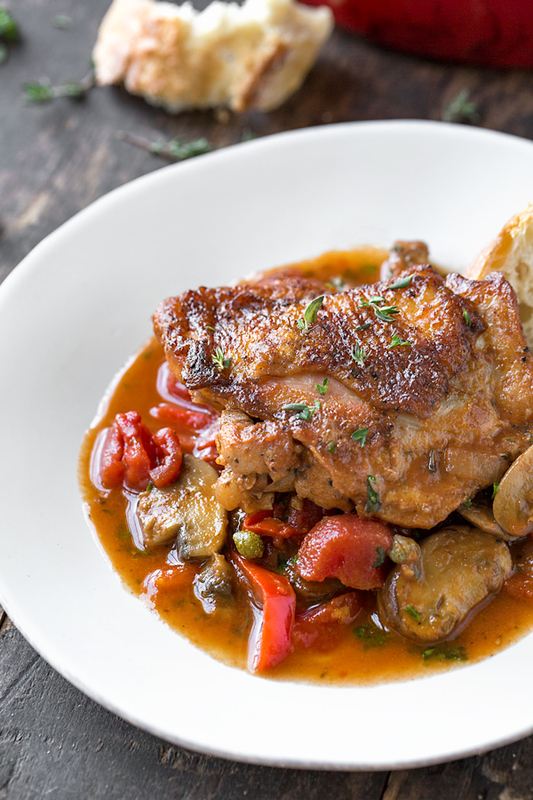 Succulent, savory and juicy, this recipe for chicken cacciatore (or “hunter’s style” chicken) comes with a rich, flavorful sauce filled with aromatic vegetables, wine, and herbs! A rich and saucy chicken dish prepared in a rustic fashion, using lots of aromatics, is my favorite kind of chicken dish; and when it’s prepared using only one pan, that’s even better! For me, it represents perfect comfort, the kind that can be sopped up with soft, fresh bread or spooned atop of buttery noodles, each bite a savory reminder that home cooking definitely tastes the best. Chicken cacciatore is just such a dish. 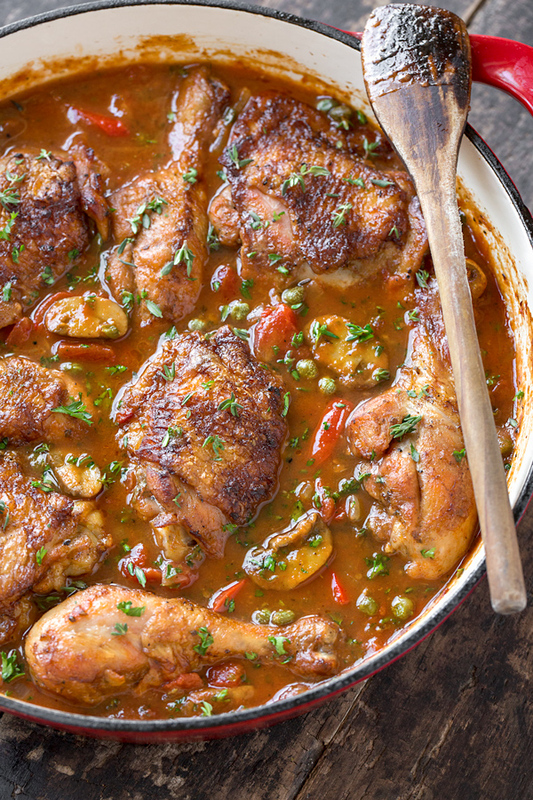 With it’s deeply developed flavors from a liberal use of onions, garlic, red bell peppers, a sprinkle of briny capers, wine and herbs, chicken cacciatore is a true example of a rustic recipe at its best and most delicious. When it’s served straight out the pan that it was cooked in, with heaping spoonfuls of the rich juices, and with the savory-sweet vegetables it was braised with, it makes for the perfect one-pan comfort meal, impossible to beat in my book. The term “cacciatore” is the Italian word for “hunter”. Another name for this popular recipe is “hunter style chicken”, or “chicken alla cacciatore”. 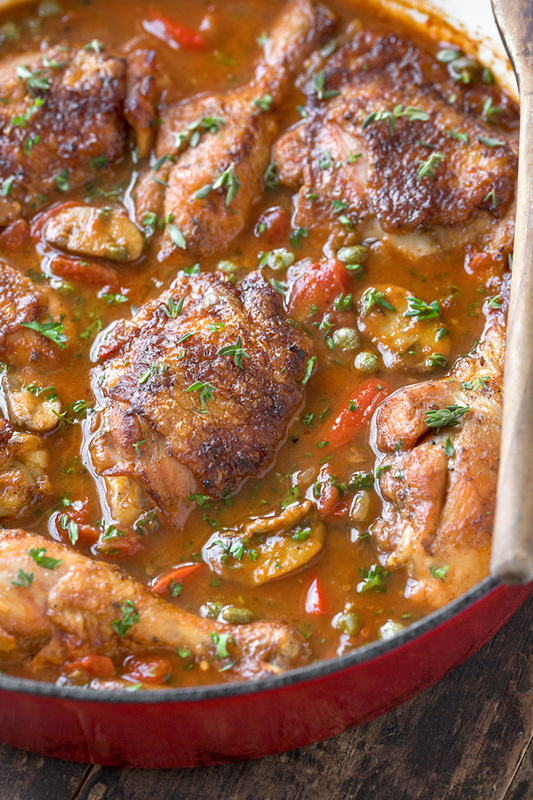 A classic chicken cacciatore recipe often consists of tomatoes, onions, garlic, and peppers. Some recipes also include mushrooms, which I also like to include in my recipe in the form of sliced crimini because they’re deliciously “woodsy” and meaty. The wonderfully aromatic herbs most often used are rosemary, thyme, and parsley, the latter two being my personal favorites to use. Often times there is a hint of wine (either white or red) added as a part of the cooking liquid, which lends extra flavor, complexity, and a hint of acidity creating some depth, brightness and balance. Chicken cacciatore is basically a braised chicken dish in which seared chicken is simmered gently in a sauce (either stove-top or in the oven), along with the aromatics and the vegetables used until juicy and cooked through. I personally prefer to braise mine in the oven, uncovered, to allow for the skin to become deeply browned and crisped! I begin by seasoning the chicken pieces and then searing them in a hot, heavy-bottom pan on both sides until golden-brown, but not cooked through; I then remove the chicken pieces from the pan and set them on a plate to hold. Next, I add in the onions, peppers and mushrooms, followed by the the garlic, and the dried herbs. I add in my tomato paste followed by my wine and allow it to reduce for just a moment. At this point I stir in the diced tomatoes with their juices, the chicken broth and the capers. Next, I nestle the chicken pieces back into the pan with the juices and vegetables, allow things to come to the simmer. Then, I place the pan into the oven for about 45-50 minutes, uncovered. When finished, I sprinkle in the fresh thyme and chopped parsley, and serve with crusty bread, pasta, potatoes, polenta, or gnocchi. Choose your chicken pieces: I prefer to use a combination of thighs and legs for my recipe, but you can use all thighs, all legs, or even breasts. Canned tomatoes: If you can find San Marzano tomatoes, these are the most flavorful; but use whatever good quality canned diced tomatoes that are available. Omit the wine: If you prefer to leave out the wine, that is perfectly fine, just substitute in chicken broth. 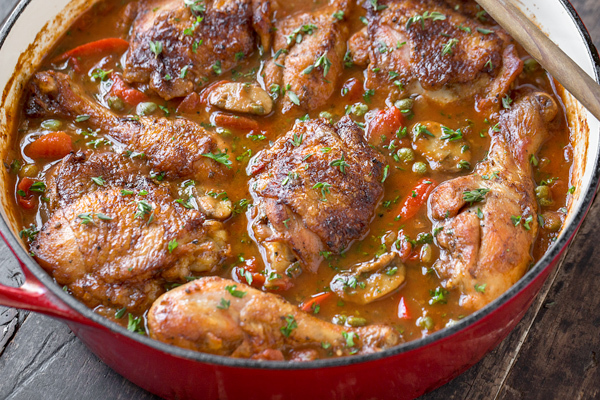 Stove top or oven: I prefer to cook my chicken cacciatore in the oven without a cover to allow the skin to become a deep brown and a bit crispy, but you can also braise it stove-top by covering with a lid and simmering very gently (on low) for the same amount of time. This rustic, flavorful, and saucy chicken cacciatore is all cozied up with fresh garden vegetables and herbs, and kissed with a hint of wine. –Preheat the oven to 350°. –Place your chicken pieces into a large bowl, and drizzle with about 1 tablespoon of olive oil, plus about 1 teaspoon of the salt, the paprika, and a couple of pinches of the black pepper, and rub into the chicken. –Place a large heavy-bottom braising pan or skillet over medium-high heat, and drizzle in about 3-4 tablespoons of the olive oil; once hot, add in the chicken pieces skin-side down (work in batches if all the chicken doesn’t fit into the pan) and allow to sear for about 4-5 minutes on each side until golden-brown but not cooked through; remove the seared chicken from the the pan and place on a plate to hold, and repeat with any remaining chicken. 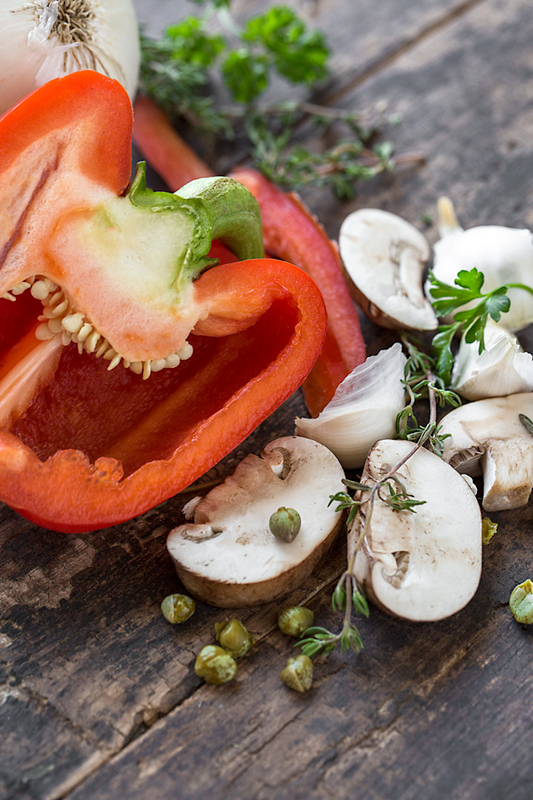 –To that same pan, add the onions, red bell peppers and mushrooms, and saute together until golden-brown, about 8 minutes; add in the Italian seasoning, along with the garlic, and stir to incorporate. –Once aromatic, add in the tomato paste and cook that for about 30 seconds to cook out the raw flavor, then add in the wine, and allow that to reduce for about 30 seconds. –Add in the diced tomatoes with their juices, along with the chicken broth and the capers, and stir those in to incorporate; nestle the chicken pieces into the pan and bring the liquid to a simmer, then transfer to the oven to braise, uncovered, for about 45-50 minutes, or until the chicken is cooked through. –Sprinkle over the fresh parsley and the thyme, and serve with bread, pasta, gnocchi, potatoes, or your favorite accompaniment. I love one pot recipes, it makes my life so much easier. Pinning this for later! Thanks for sharing. Hi Karly, my pleasure! Hope you enjoy! Hi, Ingrid ~ my mother made this for us growing up and we all loved it. I can’t wait to make this for my parents and treat them to this deliciousness. Very good. Raves all around from family. Replaced wine with more broth. Evan, thanks so much for taking some time to share your experience with the recipe with me! So happy the entire family enjoyed it! We are making this for the second time tonight. It’s a new family favorite! We use red wine. Delicious!!! Hi Baylee, I love it! I really appreciate you sharing with me that you’ve had success with the recipe— so glad you and your family are finding some comfort and warmth in it! Just curious what temperature you finish it off at in the oven?